It’s as big as a school bus, weighs up to ninety thousand pounds, and eats about one thousand pounds every day. 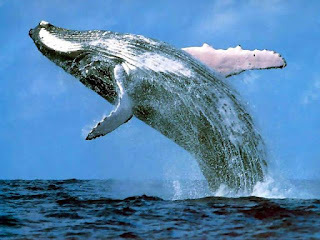 And, yet, the humpback whale is able to thrust itself out of the water in incredible displays of power. They frolic and breach in the warm waters by Hawaii where they travel to every winter to breed. My husband and I went on a sailboat snorkeling excursion while in Maui in January and witnessed these magnificent aquatic shows. Whenever spouting or fins were sighted we all gravitated to the best vantage point possible on either side of the large catamaran. We were mesmerized by the whales and nothing else mattered. At the snorkeling site, we donned our gear and swam by a coral reef. A whole new world opened up as we peered into clear azure water to depths up to one hundred fifty feet. Scores of fish darted among us, as if to parade their varied hues, shapes, and sizes. They captured our attention, but not like the humpback whales had. Aren’t we the same way towards people? The big, the bold, and the loud command our highest regard. We clamor to get a view of the prestigious, larger-than-life musicians, actors, and sports heroes. I’m guilty of nudging forward in a crowd of spectators in order to get an autograph from a couple of famous golfers—while lesser known, but equally talented men walked by—largely unnoticed. Significance. Presence. Voice. If we’re honest, we all crave to be recognized and valued. We feel small and unseen. We forget that God isn’t impressed by the same things that we are. The Lord values each one of us, and even exalts the least of us in His perfect love. Heavenly Father, thank You for giving each of us significance.